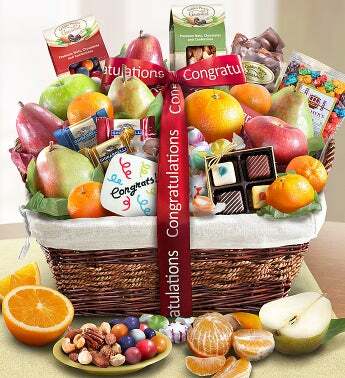 Say Congratulations in a big way when you send this impressive taste sensation! This handsome walnut stained wicker & rope basket is fabric lined, tied with a Congratulations ribbon, and filled with fresh fruit, nuts, snacks, chocolate and other candies. Make it a gift they'll remember!